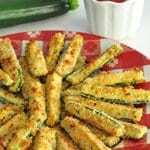 Baked Zucchini Sticks | JPMA, Inc. Mix eggs and water together in a small bowl. Mix cheese, cereal and herbs together in another small bowl. Dip zucchini sticks first into the egg mixture and then into the cereal mixture.